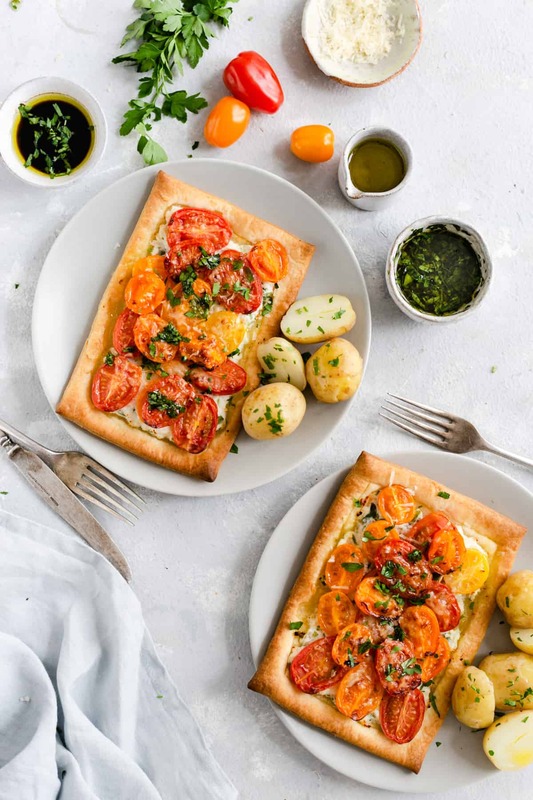 This mixed tomato and cheese tartlet will make a great lunch or dinner meal. 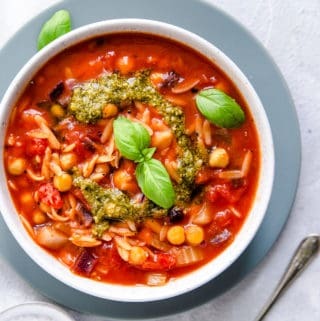 Easy recipe, 8 ingredients and only 30 minutes to make! I’m finally back to my usual, Monday posting schedule and I hope it will stay this way. 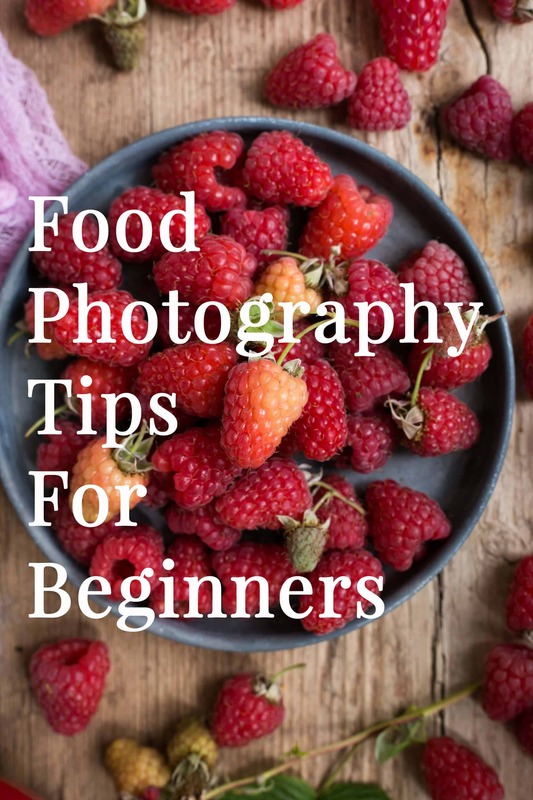 As some of you may know, I’ve held food photography workshops last Sunday (with lovely Donna from Eighty Twenty Nutrition), and this is what took most of my time over the last few weeks. But now, with workshops done, I have every intention to concentrate back on the blog and bringing you fresh, delicious recipes every Monday! Let’s look at what’s in store today, shall we? As soon as March comes around, I naturally crave fresher, lighter and more colourful food. 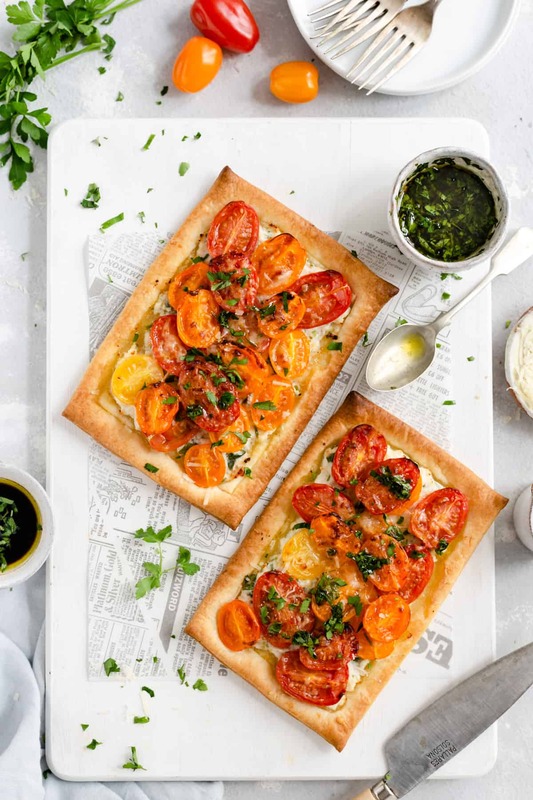 These mixed tomato and cheese tartlets are packed with beautiful, juicy and vibrant baby plum tomatoes, making it a nice change from heavy stews and curries I’ve been eating in the winter months. 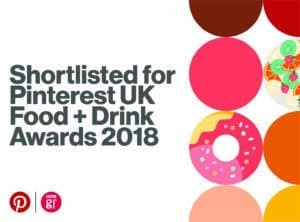 The recipe comes from Waitrose and their Beautifully Simple range. They never disappoint and always blow me away with how delicious they are. 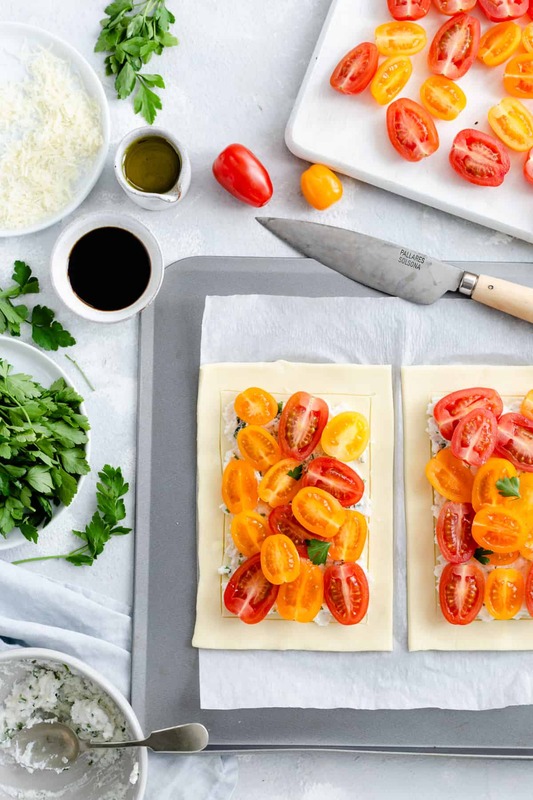 Tomato tartlets are made with simple ingredients, and require a minimum effort to prepare. They will make a great lunch or dinner, served with side of baby new potatoes and small salad. 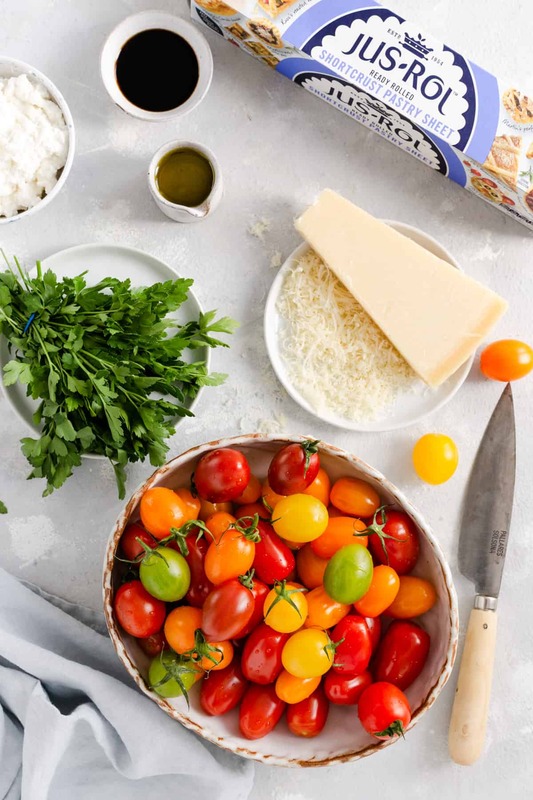 What ingredients do I need to make mixed tomato and cheese tartlets? Let’s look at the simple ingredients for this recipe. The main ingredient and the star of the dish- baby plum tomatoes. Sweet, juicy, full of colour and joy. You can use the mix of different colours, or stick to just one type. I’m using golden and red plum tomatoes. The base is made from ready-rolled pastry. Puff or shortcrust will work fine. We also need some ricotta as well as Italian-style, vegetarian hard cheese (or Parmesan or Pecorino for non-vegetarians). Fresh parsley, extra virgin olive oil and splash of balsamic glaze. That’s it! 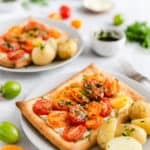 How do I make tomato tartlets? Just like in my Charred Asparagus Tart recipe, this recipe starts with pastry. Make sure to take it out of the fridge about 10 minutes before. Start by unrolling the pastry and slicing it in half. You will only need half of it for this recipe, but you can easily double it (4 people) and use all of the pastry. Using a sharp knife, score a boarder (about 0.5-1cm) around each tart. 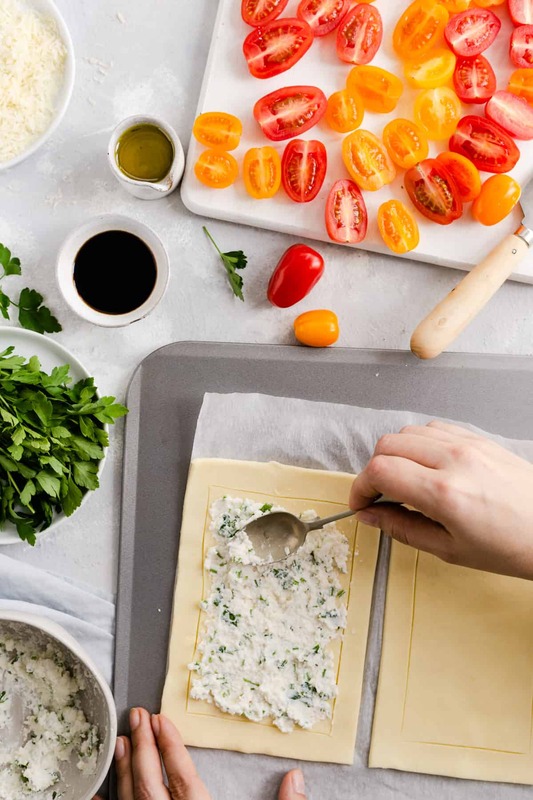 Mix the ricotta, finely grated hard cheese and finely chopped parsley stalks together. Spread this mixture on top of each tartlet, avoiding the boarders. Next, add the tomatoes. Scatter them over the top, in densely packed overlapping layer. Drizzle with one tbsp of extra virgin olive oil, season and sprinkle with some more of the finely grated cheese. Bake for 20-25 minutes until pastry is puffed up and golden. 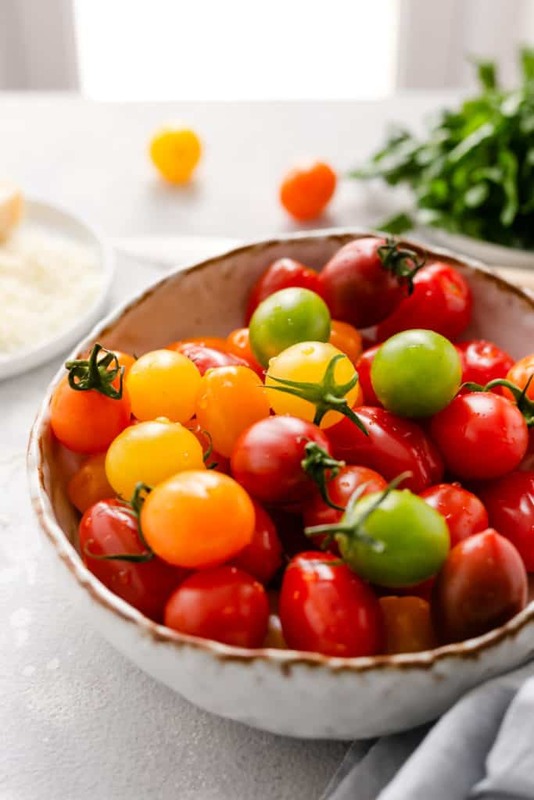 While the tomato tartlets are baking, prepare the dressing. Mix the remaining olive oil with one tbsp of balsamic glaze and add chopped parsley leaves. Cook some new potatoes and serve baked tartlets with dressing and new potatoes on side. How easy was that? That’s it for today! I hope you’ve enjoyed this simple and quick recipe, and as always, let me know if you try it! Feel free to leave me a comment below and remember that you can follow me along on my Instagram, Facebook or Pinterest! Super easy, quick and delicious tartlets with mixed baby plum tomatoes. Perfect dish for lunch or lighter dinner. In a small bowl, mix the ricotta, grated hard cheese and finely chopped parsley stalks. Spread this mix over the tarts, avoiding boarders. 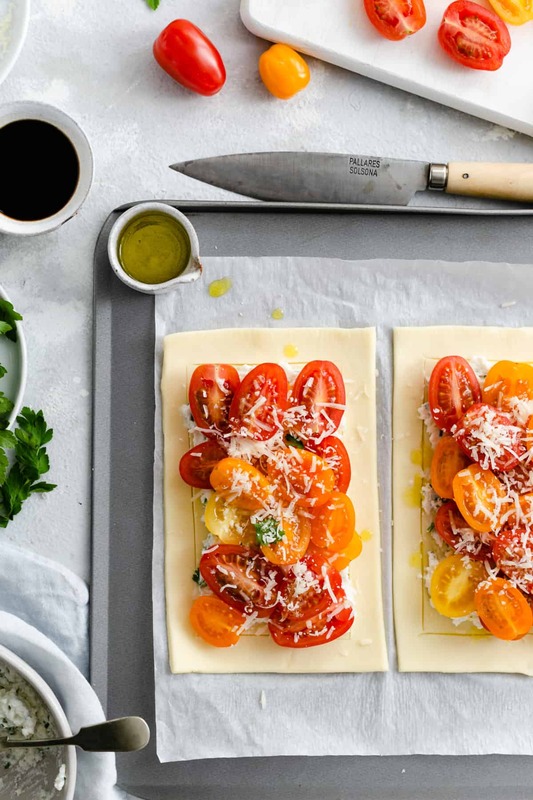 Scatter the tomatoes over the top (pack them quite tightly), drizzle with 1 tbsp of olive oil, season and sprinkle with some more finely grated cheese. Bake for 20-25 minutes until golden. Mix the remaining 1 tbsp of olive oil with balsamic glaze. Add chopped parsley leaves. Serve tarts with cooked new potatoes and drizzle with oil-balsamic dressing. You can use shortcrust pastry instead of the puff pastry. Any unused pastry can be rolled back and placed in the fridge to use in a another recipe. If you would like to receive my latest recipes and posts straight to your inbox, make sure to sign up to my mailing list! This is a great little savory dish when you need something simple, yet elegant! I don’t really eat tomatoes, but the rest of my family loves them so they would be all over this! Hi Katherine, thanks so much for stopping by and for your comment! I hope your family will enjoy this easy and delicious recipe! Oh, puff pastry tarts are one of my favorites! It makes everything so delicious, and those fresh tomatoes have me ready for spring. This is definitely going on our spring and summer rotation! Thanks so much Amanda! 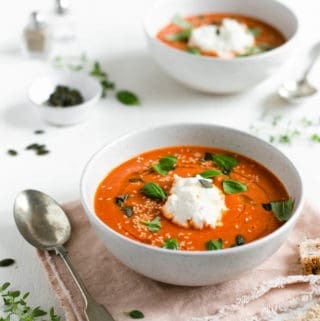 I’m so glad to hear that you like the recipe and that it has put you into spring mode! Yay! this is so fresh and beautiful! i cannot wait until tomatoes start blooming so i can get some fresh ones. so much better than grocery store versions. Thanks for visiting Danielle! Homegrown veg will always taste better than shop-bought ones, however, my local farmers market sells some great tasting, locally grown varieties too! Thanks so much Esha! I do love savoury tarts too, and need to make them more often, as they are so easy! Spring is coming for sure, and I can’t wait for all the fresh produce of the new season! 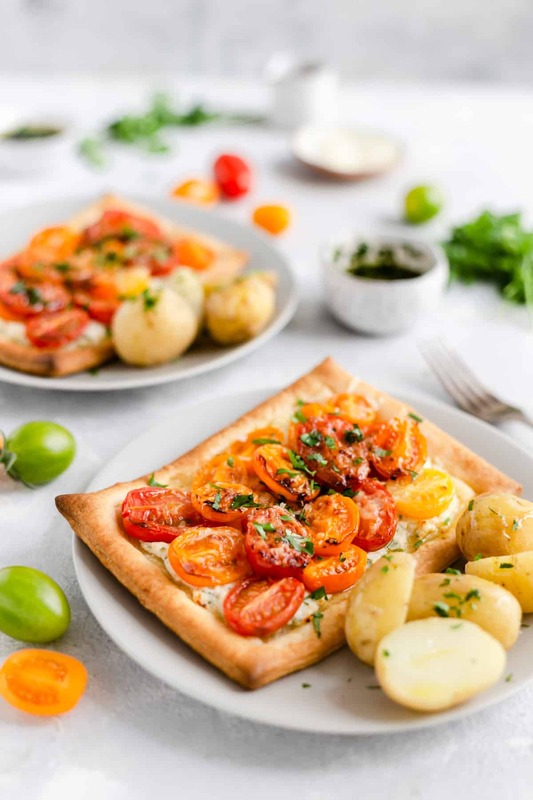 for someone who has a neighbor with a plentiful amount of cherry tomatoes this recipe is amazing 🙂 I know what i will be sharing with her when the next harvest comes ! Lucky you Analida!!! Wish I’ve had a neighbour who grows their own fruit and veg and shares them with me! Thanks for stopping by and have a great weekend! Hi Cathleen, so glad to hear that you like the photos and the recipe! My other half is not a fan either, but he actually liked these tarts! Let me know if you try them, I would love to know what you think! This makes me soooo ready for my garden this year!!! So simple but a perfect little eat! Thank you Lorie! I’m gonna be growing my own tomatoes this year too, fingers crossed they will look as beautiful as these! Hi Pearl! Thank you for stopping by! 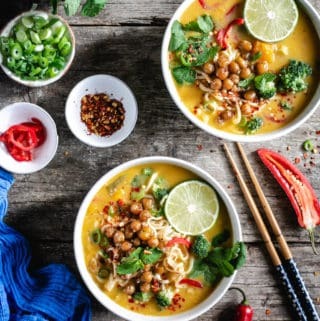 Glad to hear that you like this recipe! Ok this looks amazing!!! I’ve never made a tartlet before and this looks like something I’d totally enjoy! Both my son and I love little tomatoes so this is right up our alley!! Really informational too – love how you laid this out in the sections!!! So helpful to me!! Hi Amanda! Thanks so much for stopping by! Glad to hear you and your little one enjoy the baby tomatoes, they’re so great to snack on too! And I’m so glad to read that you have found the prep shots helpful! Enjoy your week ahead! 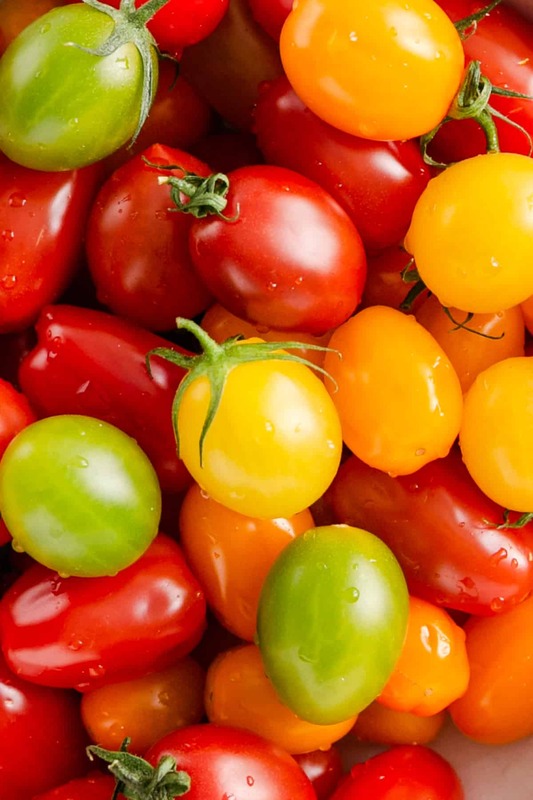 Love your photos of the tomatoes! So bright and vibrant! This would definitely go over well in my house! I like that it can be an appetizer, or it can be paired with some potatoes or a side salad for a delicious lunch or dinner! This would pair perfectly with our Easter brunch. I love the use of tomatoes. I am going to keep this recipe for all my garden tomatoes. Hi Deseree, thanks so much for your comment! They will totally make a great addition to Easter brunch! Glad you like the recipe and I hope you will try it soon! 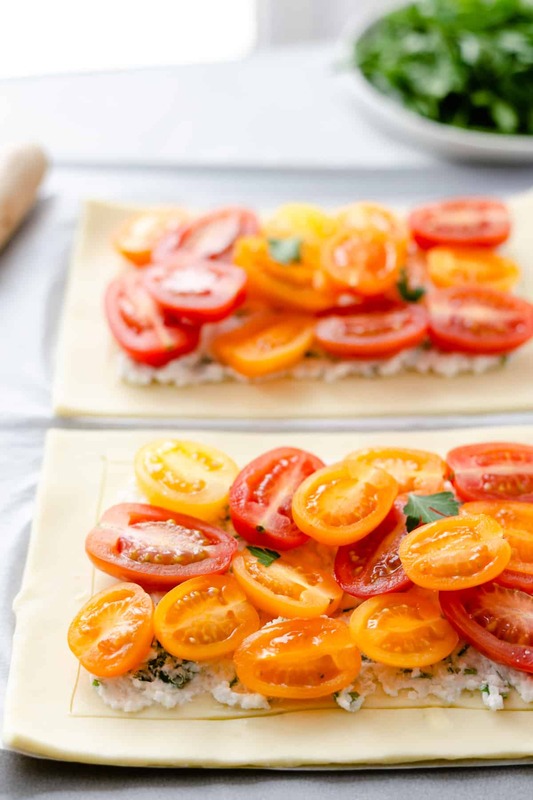 What a great way to use up summer tomatoes! I can’t wait to use mine with this recipe. Pinning for later! Thank you Jacquelyn! Glad you like this recipe! I can’t wait for the new season and all the fresh produce!